America's favorite self-taught cook opens up about the most memorable moments of her life to date in this candid memoir-inspired cookbook featuring more than 125 recipes. "Working in hospitality is hard on the body. But, if it's in you, if it's in your blood, kitchens are your happy place and food is as good for your soul as it is for feeding any appetite. Every nick of the knife, every burn and every ache and pain can go almost unnoticed and ultimately is more than worth it. At fifty, I could be better looking but I couldn't be more fulfilled." As her fiftieth birthday approached, the woman who taught America how to get dinner on the table, fast, started thinking, not just about what to make for dinner, but how her passion for food and feeding people developed over a lifetime. Where did it come from? How did it grow? Where will it take her next? 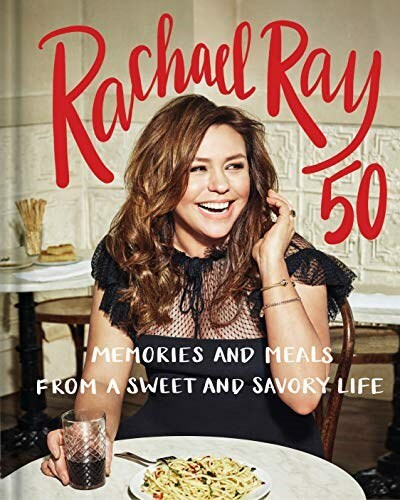 Now, Rachael Ray reveals how her mother and Italian grandfather instilled in her a strong work ethic, problem solving skills, and overall love of cooking, and how her time as a dish washer and soda fountain girl shaped her work philosophy; why muggings at gunpoint (two!) eventually led to her career in television, and how competing (and winning) on Iron Chef turned out to be one of the hardest days of her life; plus tales of the friends she's made along the way, like Oprah, Michelle Obama, Jacques Pépin, and many others. Peppered throughout is her kitchen and life wisdom, along with her philosophy on how we can better serve the world and each other. The accompanying recipes range from all-time favorite recipes and meals to unexpected dishes like French cuisine, her endeavors into baking, and some of her husband John's tasty cocktails. They include: Bavette with Green Peppercorn Sauce Verte, Smoked Oysters with Lemon-Horseradish Mignonette, Mushroom and Chard Crostata, Brown Butter Balsamic Ravioli, Beet Arancini, Nduja Deviled Eggs, Stone Fruit Galette, Negroni Freeze, and a serious Porchetta. Plus favorite recipes for your pets! Complete with gorgeous food shots, personal collection photos, and Rachael's own hand-drawn illustrations, this is a revealing and intimate glimpse into Rachael's world and her every day inspiration.